I've tried removing a friend from my PlayFab friends list, but the website just gives an "error" without a detailed message. I probably know what is happening and that is that I already have removed this friend. The problem is that the friends list just doesn't update. Maybe one of you can help me out? 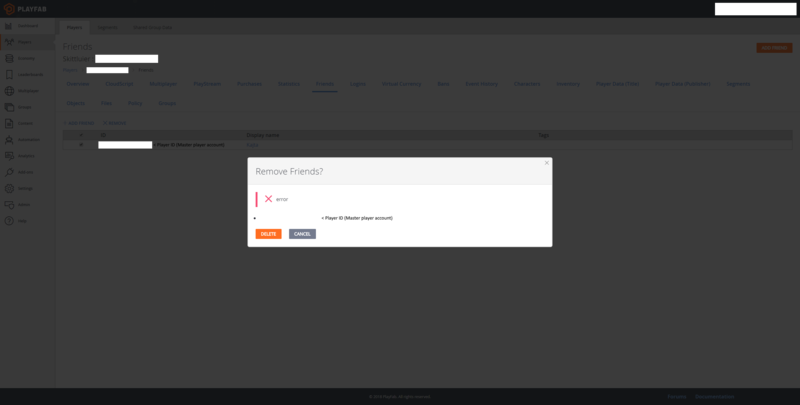 I'd believe you are encountering the same issue here: https://community.playfab.com/questions/24373/deleting-all-user-which-are-friends-even-showing-i.html. This is a known issue. For more information, please see @Brendan's comment.